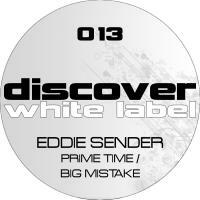 Eddie Sender has been producing for several years and his extensive catalog reflects this with many of them receiving support from the likes of Above and Beyond, Tiesto, Armin Van Buuren and Ferry Corsten. This latest E.P. release again showcases Eddie's unique production style, that perfectly combines trance, progressive and techno with flair and class. Yet another cool addition to the Discover camp! 'Prime Time / Big Mistake' is available now from Beatport and iTunes.